In hemodynamically unstable patients with BAT, management depends on: presence or absence of intraperitoneal hemorrhage. Therefore, focused abdominal ultrasound (US) exam (or in some instances a diagnostic peritoneal tap [DPT]), to make this determination. 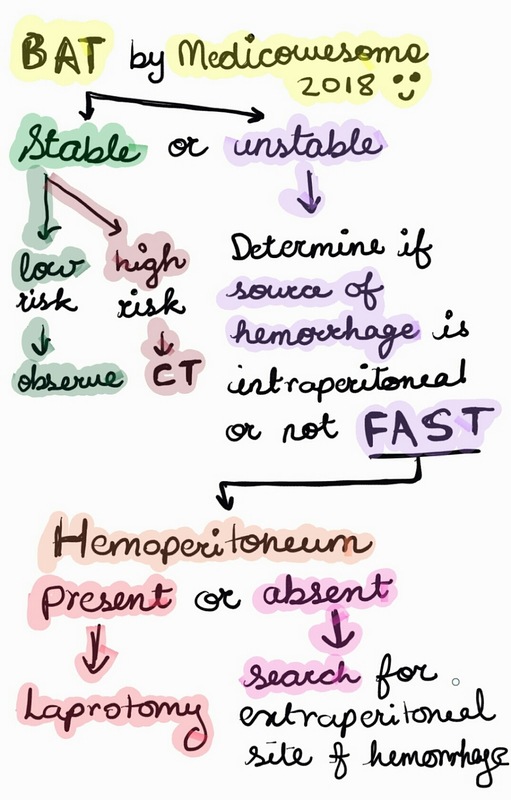 No hemoperitoneum: Search for extra-abdominal sites of hemorrhage. If stable - assess risk for abdominal injury. Management: Nine-hour period of observation - serial vital signs and abdominal examinations. Management: CT scan is the preferred modality for identifying such injuries.